India is the world's third-largest producer of crude steel and is expected to become the second-largest producer in year 2016. 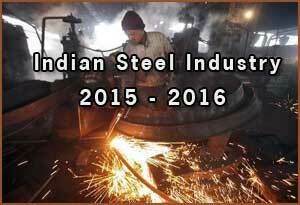 India's crude steel capacity reached 109.85 Million Tonnes (MT) in 2015, a growth of 7.4 per cent. Production of crude steel grew by 8.9 per cent to 88. 98 MT. Total finished steel production for sale increased by 5.1 per cent to 92.16 MT. Consumption of total finished steel increased 3.9 per cent to 76.99 MT. The steel sector in India contributes nearly two per cent of the country's gross domestic product (GDP) and employs over 600,000 people. India's steel consumption for FY 2015-16 is estimated to increase by 7 per cent, higher than 2 per cent growth last year, due to improving economic activity as per an Industry report. According to the data released by Department of Industrial Policy and Promotion (DIPP), the Indian metallurgical industries attracted Foreign Direct Investments (FDI) to the tune of US$ 8.7 billion, respectively, in the period April 2000-September 2015.